Robyn O’Brien is recognized by Teri Hatcher, Kourtney Kardashian, Kristen Bell and moms around the world. She has been called “food’s Erin Brockovich” by The New York Times and has been named by SHAPE Magazine as a “Women To Shape the World”, by Forbes Woman as one of “20 Inspiring Women to Follow on Twitter,” and by The Discovery Channel as one of its 15 Top Visionaries. 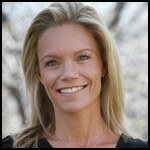 She is a former food industry analyst, author, mother of four and the founder of AllergyKids Foundation. Robyn graduated as the top woman in her class from business school before working as a financial analyst that covered the food industry. She is regarded as an expert on children’s health policy. She has appeared on CNN, The Dr Oz show, Today Show, Good Morning America, CNBC’s Kudlow Report, Fox News and in several documentary films, including Food Patriots, Unacceptable Levels, Genetic Roulette. Robyn’s work has been recognized by individuals such as Yoko Ono, Robert Kennedy Jr., Ted Turner and Prince Charles. She is the author of The Unhealthy Truth (Random House 2010) and her work is seen in Food, Inc. filmmaker Robert Kenner’s 2012 video, Labels Matter, and in Jamie Oliver’s Food Revolution. She is the founder of the visionary organization AllergyKids Foundation which is focused on restoring the integrity of the food supply and the health of children. Caryn Hartglass : Hello everybody. I am Caryn Hartglass . You are listening to It’s All About Food. We are really swinging into summer now. It’s June 25th, 2013. Beautiful outside in New York City and it’s one of my absolute favorite times. It doesn’t last very long, but the linden trees are in bloom. Can you smell them from where you are? I hope so. It is the most fabulous aroma; the most fabulous fragrance. It is very brief; it lasts about a week. I am very fortunate to have a linden tree, growing tall just outside of my terrace and I am really enjoying that this week. As I have mentioned a few times on this show lately, it is all about breathing because next to food, which is really essential, breathing is even more essential. Why not make it delicious by breathing in such beautiful, fragrant, linden-scented air? I’m happy. Now, I want to remind you that I am the founder of ResponsibleLivingandEating.com. Please visit. We have always got some fun things going on there making responsible living and eating fun, joyful, and delicious, etc. If you want to chat with me at any time, send me an email at info@realmeals.org. Okay, now on to my first guest, Robyn O’Brien. She has been called the “Food’s Erin Brockovich” by The New York Times and has been named by Shape magazine as a “Woman to Shape the World”; by Forbes magazine as one of “20 Inspiring Women to Follow on Twitter” and by The Discovery Channel as one of its “15 Top Visionaries”. She is a former food industry analyst, author, mother of four, and founder of Allergy Kids Foundation. That’s what we are going to be talking about today. A lot more about Robyn can be found at her website RobynOBrien.com and AllergyKidsFoundation.org. Welcome to It’s All About Food, Robyn. Robyn O’Brien: Thanks so much for having me. Caryn Hartglass: I was watching your Ted Talk on your website and you have a great story and I think the best way to share the importance of anything, really, is through individual stories. That’s what resonates most with people. I am sorry that you had to go through what you went through but, I think, it’s wonderful what you are doing with your experience. Robyn O’Brien: Well, you know, I think for so many of us, we have a wakeup call when comes to our food supply and for some, it’s really a hard one. It can come in the form of a loved one with cancer or a child with allergies or asthma or some other condition, diabetes. But what we are realizing and what I am realizing is I am not the only one. I mean, we are really having a food awakening around the country now as we realize how illiterate we have become when it comes to how our food is produced and what goes into it. I think the more of us that really step forward and say, “Hey, I had no idea and this is what I am learning today, now, and this is how I am going to make some changes and do some things differently,” then it gives other people permission to do the same. Caryn Hartglass: So, just in brief, so my listeners know, and maybe we will more into it in a little bit, basically, you were a mother of four, I believe, and your youngest, all of a sudden, had an allergic reaction and that started your entire new journey learning about what’s in our food, how dangerous it can be and what to do about it. Robyn O’Brien: Absolutely. Up until that point, I had dismissed any concerns. I really wasn’t that sensitive to food allergies. I really just trusted that everything on the groceries shelves were fine and are safe. It never occurred to me that there could be a different standard. I had covered the food industry as an analyst on a financial team and so I understood very well how the business model worked and how you can swap out real ingredients for these artificial ones to help drive profitability. But, as I really started to investigate what had happened in the food supply, especially in the United States, I realized that we were using a whole bunch of artificial ingredients and artificial growth hormones and artificial dye and all these artificial things that other countries had either banned or never allowed in the first place. Caryn Hartglass: Did you know any of this before you started on your investigation about what was in our food? Robyn O’Brien: No, not really and I had plenty of people certainly try to tell me. I just wasn’t ready to hear it. I dismissed it as a hobby or lifestyle of the rich and famous or some kind of alternative thing, really. It really wasn’t until I dug into the business model that I really understood the financial incentives that are in place by the food industry and why they would use artificial ingredients. They are way cheaper to produce. But, then to compare that to what was happening overseas and how our very own corporations were formulating their products differently for eaters in different countries. That, to me, that double standard was really the point where I thought we have to demand the same change in the U.S.
Caryn Hartglass: I want to linger on this a little bit longer because one of my frustrations is outreach, reaching out to people and getting them the information that they need because there are so many really smart people, well educated, that don’t want to know the information or don’t know the information . I am just wonder, since you have been there and you have been through it, are there any tricks or do we just make our steps, our baby steps? Some people going to need some life altering experience that is somewhat painful in order to get there. Is there a way we can move the masses a little faster? Robyn O’Brien: No, I think we are seeing it; we are seeing it happen. Food is such a loaded issue. It’s emotional, it’s social, it’s cultural, and it’s economic. There are so many factors that influence food. When you suggest that somebody might want to navigate the grocery store differently, that could be loaded with how their parents are going to respond, how their grandparents might have responded. So, it can trigger a lot more than just how you shop. I think one of the greatest things we are seeing today is that retailers are responding for us. They are saying, “We see there are growing concerns with these artificial ingredients in our food supply and we are starting to formulate our products differently.” So Target, Safeway, Kroger – they are all rolling out product lines that are free from these artificial ingredients. It it is not something that you can force on anyone. They have to come to it themselves. It is a very loaded topic. I think more the marketplace makes these products widely available, which is starting to happen, the easier it is going to become. Caryn Hartglass: Okay, here is another thing. I have a background in chemical engineering and one of the things that always frustrated me – and I realize it in hindsight now –is when we would do these examples in class with a return on investment and we would evaluate how good it was designing a certain business. But, we never, ever included in it the social ramifications of any business and, as a food industry analyst; I know that’s not in the equation either. Don’t we need to put that in the equation of a business? If it is really successful, that it really should have some sort of social good to it rather than social bad? Robyn O’Brien: I think in a perfect world, if we had the chance to redefine capitalism, we would. I think when it was originally structured in what’s called the fiduciary duty of these executives of any company, not just the food company, any industry, their job is to drive shareholder return. In the food industry, the best way to do that is to lower the cost of production and to use cheaper ingredients. So, that’s their job, that’s what they are paid to do, that’s what their board of directors expects of them. Some companies, like Annie’s, take a higher approach. They say, “Hey, we are going to be mindful of the fact that we need these consumers on this planet for a while. If we externalize all these costs, then that’s going to limit our capacity in the future.” So, you have these companies that are mindful of the future as well as focusing on the present. We are starting to see that shift. What I think legally, right now, is their obligation is to drive shareholder return and until that legally is changed, it’s what they are paid to do. Caryn Hartglass: That’s the truth. That’s all there is to it. I am looking forward to some new economic system. Mindful capitalism. Something like that. Now let’s talk about what you have done since the veil was lifted for you. You were sitting there with your children – how old were they at the time when this all happened? Robyn O’Brien: Oh my goodness! They were one, three, five, and six, and today they are eight, ten, twelve, and thirteen. Robyn O’Brien: So much has changed. We have navigated the different stages of childhood. Now ,I have a teenage girl and very mindful of the children learning to make these choices themselves so there wasn’t some restriction they placed on them. That they could learn that they matter so much and to really value and appreciate the choices that they make and how the food that they put into their bodies can affect them. Not only today but over the long term. It was a real education for our entire family. It didn’t happen overnight. You don’t potty train a kid overnight. You don’t wean them from a sippy cup overnight. We started pretty slow. We made gradual changes so that it didn’t rock the family budget. We weren’t changing grocery stores immediately. There was none of that. As we started to introduce these changes, it was empowering and you realize we’re not going to make the perfect ‘enemy of the good’ and we are going to focus on progress not perfection. So with that, we were really able to incorporate these changes at a pace that we could digest. Caryn Hartglass: Now, anyone can do that and all of should be doing that. But, when you are hit with a crisis, there are some things that you have to respond to immediately. Was it your one year old was allergic? Robyn O’Brien: She was the one that had the immediate, life-threatening reaction , that races to the pediatrician on a Saturday and that was sort of the wakeup call because I didn’t even know what a food allergy was. A food allergy is when your body sees food as foreign. Then, I am thinking is there something that was foreign in the food that wasn’t there when we were kids? As I really was studying that over the first few months of her diagnosis, I really started paying attention to the other kids. I realized that there were issues that were going on with them that were not been flagged as food related but were very much food related. So, I started looking at food allergies and thought you can have this immediate, life-threatening reaction or you can have this kind of delayed reaction that can manifest up to three days later. It was in that process that we really started to realize that food can have such an incredible impact on the health of the child. Caryn Hartglass: That’s the really challenging thing because some foods will affect us immediately, good or bad. Some will take a few days. Some a few weeks sometimes. And some years. I noticed you have Dr. Joe Furman on your board of advisers and he is one of my favorite, no, he is my favorite doctor, period. He wrote a book, Disease Proof Your Child. talks about what happens in the womb and very early on with children that can affect them decades later. Robyn O’Brien: Right, and I think as a mom, that is incredibly hard to hear when you are not aware of your choices and how they can impact your kid. That was so hard for me to hear because you think, “I can’t unwind that.” But, once you learn, you can’t unlearn this. That’s when you realize there is so much that you can do today to help protect the health of your kids tomorrow. Caryn Hartglass: Well, the great thing is the body is so forgiving. Once you take away the problems, in most cases, the body will totally heal and thrive. Robyn O’Brien: Absolutely and the part about children is that they have a long runway. So, there is plenty of opportunity. Caryn Hartglass: What was it one specific allergy your child had or was it more? And, has it continued? Have you removed certain foods from the diet totally? Robyn O’Brien: You know, for her the immediate reaction that morning was to egg. Then, with one of my sons, he had a real issue with dairy and so as we started to modify, there were moments where I didn’t – I had no ideas what alternatives were to cow’s milk. That was all I had known growing up. To learn how to navigate the grocery store differently, where these products – where you can find them – it was intimidating. Part of my work today is to help moms through that process to fell that you are not the only one, that you don’t have to be intimidated. There are so many of us now that are sharing this work. We did, we made some pretty big changes and I think the biggest is we went to a heavy, processed, fake food diet to food that were just made from real ingredients. That shift, in and of itself, simplified so much because we were eating foods that contained ingredients that we could pronounce, that my grandmother could have recognized instead of all these artificial, reengineered new things that came straight out of a laboratory. Caryn Hartglass: Yeah, it’s pretty scary what’s out there, pretty scary all in the name of profit. Now, there are a lot of moms that don’t want to hear this information. So, I am not exactly sure how you go about your outreach and information. What goes on at Allergy Kids’ Foundation? Robyn O’Brien: I was a mom and so I always lead with that. I didn’t want to hear this; I wanted to dismiss it. It was hard enough to feed four little kids and nobody wants to be told what to do and what to eat and what to feed their family. So, I come at it with that understanding of how difficult this landscape is today and how we wish that the rules and the recipe books and everything that our mothers used could still, somehow, apply to us today. When you look at the escalating rates of allergies and autism and asthma and diabetes and pediatric cancer, the game has changed. I think I want to just honor that with complete honestly then people don’t feel like you are preaching at them, that you are not trying to force a change on them. That you are simply saying, “This is what I learned and I feel that it is a gift to have this knowledge now and I will share it like that, as if it is a gift that I want to share.” Then, people can take it if they want to. Caryn Hartglass: That’s right. Take it if you want it. If not, all the best. I am thinking about your kids now and you are older and you have given them some really great tools. Has there been any pushback along the way? Robyn O’Brien: It definitely has and there has been some sneaky stuff. One of the things that I learned from the doctors that I have worked with is that acne and different skin issues from eczema to acne can be the result of underlying food sensitivity or food allergy. In in our family, it is definitely the case with dairy. One of the boys came in with this big spot on his nose and just could not believe, “What is this mom?” I told him, “What are you eating at school?” Then out it all came. He had been getting some yogurt and some granola and which is totally, 100% fine for some kids, but for a child that has a dairy allergy, it can trigger a lot of inflammatory conditions and for my son, that’s what it does. So, I let them experiment but also let them understand the consequences. That’s what we have done every step of the way. You are free to choose what you want to choose. But, in doing that, you are also going to be dealing with the consequences of your choice. So, that’s how we have gone about teaching them. Caryn Hartglass: I like that. It’s important to empower kids with these kinds of tools. One thing that many people don’t realize that you mention that you didn’t want to be told what eat, you don’t want to be told what to do. Americans, it’s in our DNA; we don’t want to be told what to do. We want complete freedom and what so many people don’t realize is how manipulated we are, how we are not free, how we’re brainwashed by all the media around us, by all the signs and social networking and everything around us and children especially are so manipulated to purchase things that aren’t healthy for them. It’s really a challenge to let people know that we are not telling them what to do; we are just telling you to open your eyes. Robyn O’Brien: Yeah, I did not want to hear any of that and I think that’s where the food issue could be so much more than food is that you want to believe what you hear on TV. You want to believe that these agencies have kept it all in check. They have, from their point of view, because they’re relying on industry funded research. The federal agencies that are in charge of overseeing the safety of the products, they don’t have the budget to conduct the independent studies. So, they rely on this industry funded research. I learned that, I thought this wasn’t the first time this has happened. This is what happened to my grandmother’s generation with the tobacco industry where you got into this period of ‘“he said, she said’ science where the industry was funding studies and where the independent studies came out sounding the alarm about saying something entirely different. I think that’s where we are with a lot of these additives and a lot of these ingredients in our food supply today. To see other countries to exercise precaution and take the lead and say, “We don’t like we are seeing so we are going to get it out,” or “There are no long-term studies so we are not going to allow them in the first place.” To exercise that same level of precaution here in the United States, to me, this makes a lot of sense. Not only to protect the health of our kids but also to protect the health of our economy and our country. Robyn O’Brien: I believe that to my toes. I think we are messaged along the way. We hear these messages in media, in magazines, and on TV that we need this to be better or that we need a better this or a better that. What people need to remember is that you are this very unique design with a very unique set of skills and talents and that’s what you have to lend while you are here. I think what you need to say is what are your unique skills? What are your talents? What are the things that you are passionate about? And, to combine these things together and to use that to fuel your work in this movement. Whatever it might be. For some people, that collection of talents will lead them to start a food company. For other people, it might lead them to start a blog to take pictures and start recipes. For somebody else, they might want to start a support group with kids with autism. There are so many ways to get involved and to lend your unique talents to restoring the health to our country. Robyn O’Brien: I think, I guess that’s the inspiration and, in all honesty, that’s going to be what’s sustainable. If you are doing something that you love that leverages what you are good at, to help restore the health our families and the health of our country, to me, that is one of the most patriotic things that anyone can be doing. Caryn Hartglass: I am reading your bio again and you have certainly gotten a lot of many famous, respectable people: Yoko Ono, Robert Kennedy, Jr., Ted Turner, Prince Charles. How do these people help move us along to a better place? We invest a lot of our energy believing in celebrities. Caryn Hartglass: I imagine that you are cooking a lot more since you have learned more about food? Robyn O’Brien: Absolutely. I actually had to learn how to cook and that was a bit of a train wreck stage, in all honesty. I burned a fair share of pancakes. I burned a lot of things. We experimented with a lot of things. Part of what I felt was this incredible insecurity; that I had to do something perfectly or not at all. As I moved through that, I thought that I don’t ever want my kids to have this hurdle where they think they can’t do this. So, that was kind of early on, I thought I am just going to have them at the kitchen counter with me and we are going to learn how to do this together. That’s what happened. Last night, one of the boys is making the guacamole. He is, “Hands off!” He is really telling everybody that “I am the chef. I am making this.” I think that part, to really arm them with the knowledge that they need, so that they can feel confident. I think so much of the food movement is exactly that. It is saying, “Hey, here I was I didn’t know how to cook, I didn’t know any of this. I felt ignorant and vulnerable. And, to say, that’s okay, this is all of us waking up together and provide this safe place for people to come together and begin to make these changes. Caryn Hartglass: Number one, find your kitchen. I always like to say that, find your kitchen,. Number two, learn how to use what’s in there. Number three, get your children involved and empower them to learn while you are learning. You can’t do any better than that. I know so many parents don’t want their kids in the kitchen. They think it gets in the way and they are trying to do things efficiently and say, “No, no, no, no – I am trying to take care of this.” That’s not really a good thing. Everybody should be working together. Robyn O’Brien: It’s not one size that fits all. For some people, you got to recognize that there are so many different challenges and there are so many different constraints facing families today. The landscape of food has changed and childhood has changed of families have changed. So, to really focus on doing what you can, where you are, and with what you have. Caryn Hartglass: Sounds pretty good. What’s your kids’ favorite meal that you make for them? Or that you all make together? Robyn O’Brien: We have some pretty avid grill lovers. I grew up in Texas and we tend to grill salmon with the husband from Seattle and then all kinds of asparagus. But, the biggest, most shocking ‘ah-ha’ moment as a mother who didn’t know any of this was the crazy success of kale chips. When someone first suggested that the kids will love it, I completely rolled my eyes at her and thought there was no way, there is no way. But yet, a drizzle of olive oil and sprinkle salt and pepper on kale and roast it in the oven for 400 for 15 minutes and to have that kind of out and just totally demolished by a pack of kids. It really does speak to how you really can educate these kids and you can really influence what they chose and what they love and their taste preferences when you catch them early on. Caryn Hartglass: There is nothing kale can’t do. It is about my favorite food. But, I have to admit I have never had kale chips. I know, I see them everywhere and I know everyone is digging them, but I just like my kale, unadulterated, raw, and in a salad, juiced, in a smoothie, steamed. But, as long as people are eating it, especially kids, that’s a good thing. Robyn, I want to thank you in joining me on It’s All About Food and for your absolutely wonderful work. Robyn O’Brien: Well, thank you so much and thanks for the work that you are doing, too. Caryn Hartglass: Okay! Have a great day. Robyn O’Brien: And you, too. Caryn Hartglass: Visit AllergyKidsFoundation.org for more about Robyn O’Brien and her work. Now, we are going to take a little break. Then, we are really going to have a really fun time speaking to Kristin Lajeunesse, “Will Travel for Vegan Food”.